I GMed my first game yesterday at the annual Gamesday for the Boston Trained Bands held at the Hobby Bunker in Malden, MA. I think there was around 16 games, they all looked great. There was one trench wars game that looked amazing, enormous amount of work must of went into the terrain. As usual, I was unable to resist playing CoC, and as there were 3 different CoC games it was quite easy to find one. Eureka Miniatures US held a demo CoC game and there was another US vs Germans game held by Austin a gamer from New Hampshire. I elected to play the latter game as the participants were all seasoned CoC gamers. Through this game I met 3 other CoC gamers, Al, Tom and Chris all from central Massachusetts. It is really striking how many gaming clubs there are in this area and how many CoC players there are. It is also interesting that unlike myself these were all very seasoned gamers (I suspect 30-40 years of gaming each) and really the constant refrain was CoC is one of the best rulesets they have played. Anyway both these morning games looked great and had the full complement of gamers signing up for each. The game I was doing was in the afternoon, one player who had pre-registered did not show up but his position was rapidly filled by Nick, a novice to CoC. I also met Greg from Southern New Hampshire another seasoned CoC gamer. With the above mentioned Chris and Austin this made my task very easy. Chris, the most experienced CoC gamer at the table, was paired with Nick. They took the Germans while Austin and Greg took the Canadians. As previously discussed the scenario I put on was from the Falaise Gap campaign in August 1944. I made some modifications to the OB for a 4 player game with an added Section/Squad to each side as well as 2 senior Leaders per side. I felt this would be a little simpler than playing Big CoC. Otherwise the scenario was unmodified. Modified from http://playingtheodds.com.au/crossroads-closing-the-gap-campaign/ Permission to use. The Patrol phase as usual produced it's usual gyrations with the sticks, I think I will move to lasers. 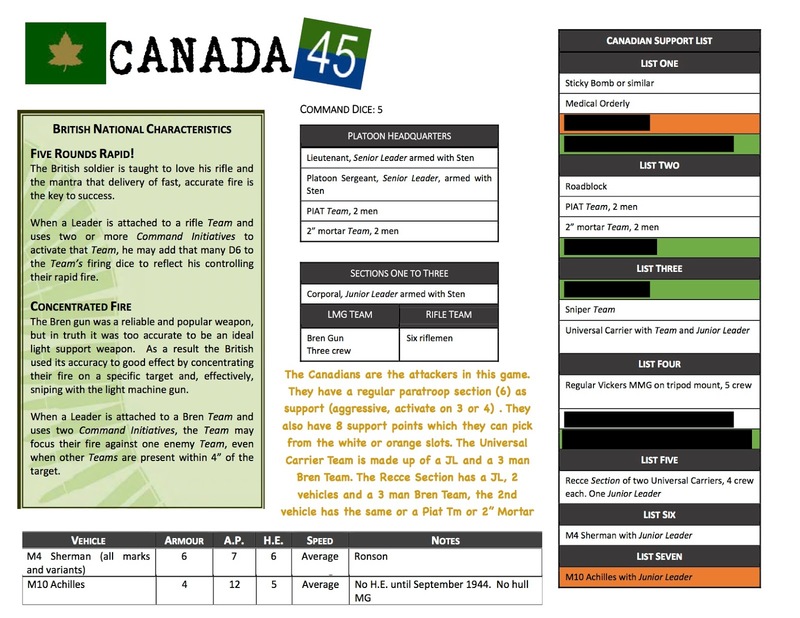 There was some complaint from the Canadian players about the lack of cover in the on their right flank, but of course that is the scenario design. No reason to make it easy for the attackers. As you can see the Germans were more successful in this stage of the game. The Canadians had all the JOP's on the left side of the road, while the Germans were able to spread their 3 JOP's on both flanks with one well advanced on the road. The Canadians were able to place a sniper in the belltower, giving them excellent LOS over the whole terrain. The Canadians advanced 2 sections rapidly on their left flank and got into position to cross the road to advance on both their right and on their left. It seemed like a good strategy. This section is now well more than half way to their objective (to be within 12" of the German table edge), so just 2' to go! The Germans place their Panzergrenadiers in stone house, but the Canadians responded by throwing down some smoke. Neither of the players had played British before, this is seems pretty typical in this part of the US. They are my favourite troops to play as I like the tactics of laying down smoke and advancing. The Germans kept their troops well hidden until the Canadian path of advance was more obvious. By now they have their field Mortar firing, and 2 squads on the table but none really visible to the Canadians aside from some in the stone house to the left in hard cover. The Canadians get across the road but take some losses including their JL being wounded. The Germans have now planked down a squad entrenched in the road and start firing at the sniper after his position was identified while they were on overwatch and he took a shot on them. 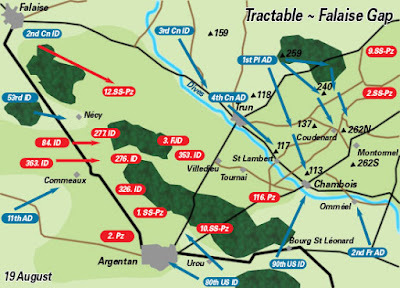 The Canadians have placed their paratroop section (a bit historically incorrect) on the road in the farground with plan to advance rapidly on the German right flank. The previous section in the road has now occupied the the stone building across from the church, but seem unable to get in good position to fire at the entrenched Germans in the road. Beware the double 6. By now the Canadians had smoked the centre obscuring all fire from both buildings on the German side. The Canadian paratroopers then hopped the wall and started their advance to the "goal line". Unfortunately the entrenched German team was able to take out the sniper as well as kill the JL leading the team on their right flank, thus stalling their advance on that flank. They had both SL's on the other side of the road which was no help. 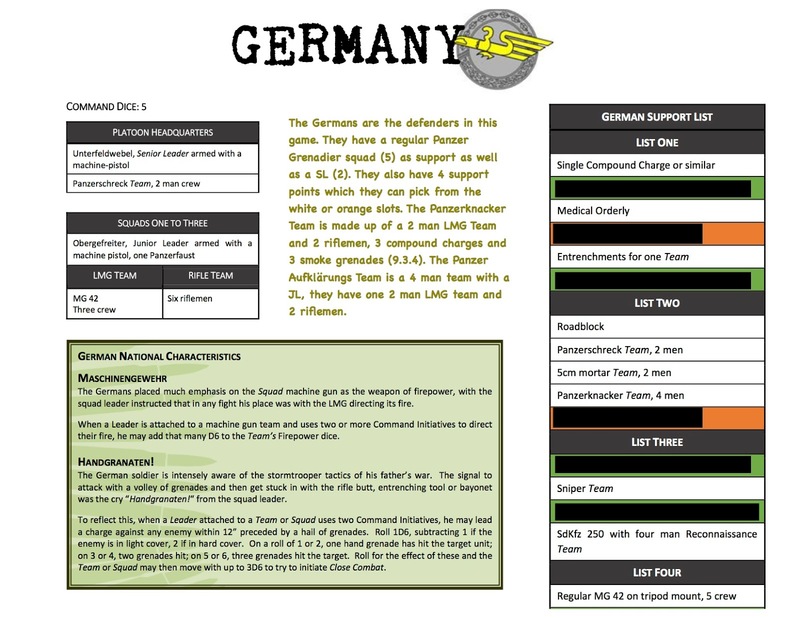 The German turn comes up and they throw the first double 6 of the game, they are able to deploy their reserve squad and rapidly advance it within close range of the paratroopers and mow them down on their second activation. By now the Canadian assault had lost cohesion, and they decided to retreat. I believe this was the prudent option, especially if this was indeed the first scenario in a campaign. So all in all I think it went pretty well, I think the only major dispute was whether a sniper could provide LOS for the on table Mortar team. Clearly the rules say so but I think this is probably not very correct as you can see by this discussion on the forum. It was a strange game that only one double 6 was thrown, no CoC dice were generated and thus it lasted just one turn of multiple phases. I believe both sides had the correct strategy to win the game, but the Germans were a little more adept at carrying out. 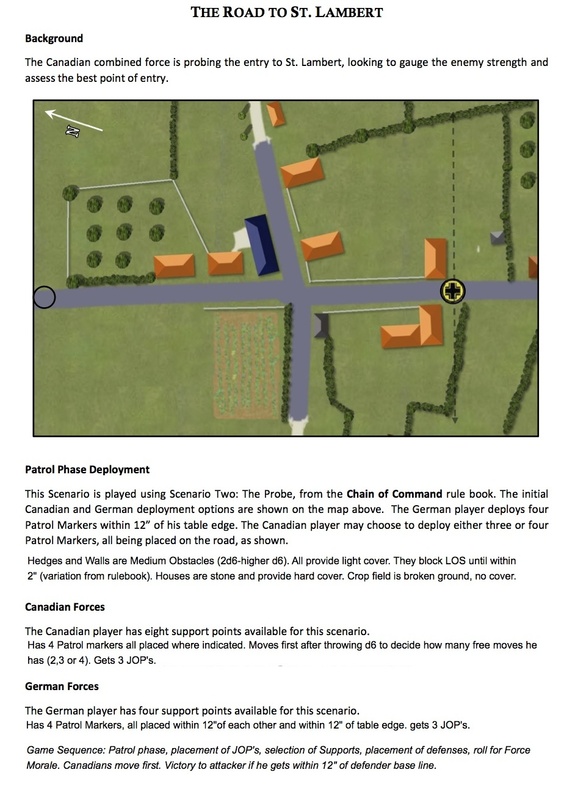 It would have been nice for the Canadians to have had a SL on each flank, and maybe they should not have advanced their paratroopers until they had an CoC dice in hand so they could have interrupted the Germans with their superior close range firepower. I would like to play this game again. 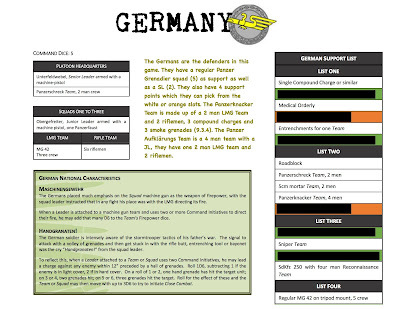 Very interesting game and battle report. I need to remember to use smoke. Do you deploy it with smoke grenades or only with the mortar team? It is done with the 2" mortar team. Great looking game and interesting report. Thanks John!